There are so many math standards that we need to teach each year, that at times, my head is spinning. As you all know, I am a firm believer in the power of Calendar Math and I really try to get most of the power standards into it. Every few years or so, I have a class in which graphing (both creating and reading them) is something that is really needed. So, in keeping with the calendar theme, I usually have them use the weather for the day as the catalyst to create the graphs. The Line Graph was a temperature record. I would have one student read a thermometer we had stationed outside of our classroom and we would plot the temperature each day. This really helped the students to show the "change over time" nature of a line graph. They could then chart trends. Each month we had a different sheet, so over the course of the year, the students could see how the weather was really changing! We were also able to discuss the differences between the two types of graphs because they really did show us different things! 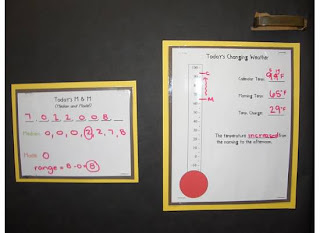 This Line Graph also tied in nicely to the thermometer reading (which is something that the kids struggle with as far as increasing and decreasing temperatures) We would use the temperature information and create a thermometer reading for it as well. If you have been following my Calendar posts, you know that Calendar is constantly changing. I am always taking things out and replacing them with things that are needed. So, I would add this section in when I took out the "Odd/Even" section, or the "How Many Ways". Are you doing Calendar Math this year? What are some ways you get those power standards in? -money - the students wrote the number of days we had been in school as dollars and cents and then we had little magnetic coins and dollars so they put the correct amount under their written amount. (ex. 86 days = $ .86 or 130 days = $1.30). -rounding - the students rounded to the nearest ten or hundred (teacher's choice) based on the number of days we had been in school. 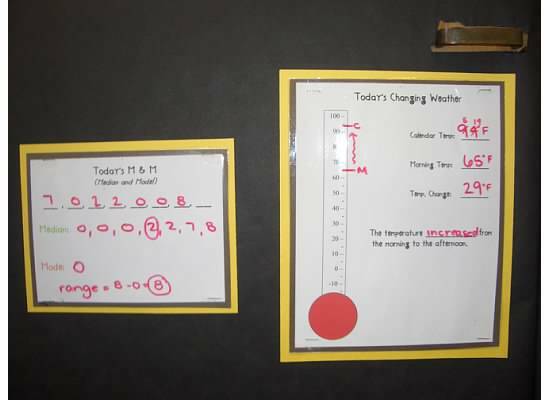 -number line - students had to write the day of school we had been in and there were special instructions for every fifth or tenth day (draw an orange circle around multiples of five or a blue square around multiples of ten). Even numbers had a line drawn under them. Odd numbers had a line over them. We put it on typewriter tape and it stretched around the room. I love your idea with the graphing! I'm definitely going to use it this year! I love everything about calendar math! I'm a 4th grade ESL teacher in Texas, and I'm so excited to try this out next year. This was my first year of teaching, and I got so frustrated with my students' lack of retention. I have no doubt that this deliberate spiraling of curriculum will pay off ten-fold. I really like the idea of color coding the temperature graph! Do you have the lower temps done or just from 62-100? 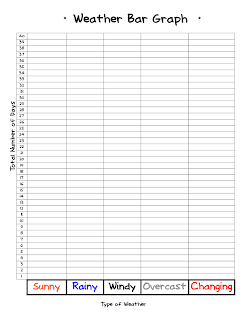 This year I am going to keep track of how many days we have been in school in standard and expanded form. I am also going to have the kids show what the numbers look like made from base ten blocks. I will be adding your temperature and graphs to my calendar. That happens to me all.the.time. I will see something and think...duh! I really appreciate your concern about this topic and I would like to tell everyone about more regarding this topic that is bar graph is a chart with rectangular bars with lengths proportional to the values that they represent. The bars can be plotted vertically or horizontally. A vertical bar chart is sometimes called a column bar chart. I have become obsessed with reading all of your math posts and I can't wait to implement so many of the ideas I am learning when I go back to school in September. Thanks!! Hi, you might have probably done this already - but seen as you mentioned it in your post I thought I'd reply. You mentioned trying to make a pie chart. 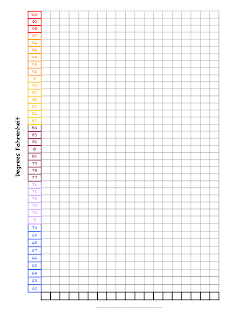 I have daily graphs in my class - the temperature line graph and weather type bar graph. What I've done though is create a bar graph for the month. So at the end of every month, my kids create a pie chart of the type of weather we saw that month. Great way of learning angles to the nearest degree also when creating the pie chart.